For the duration of March we were seeking work from photography graduates alongside Loupe Magazine to reward with a collection of prizes and interviews. A lot of time was spent looking through the submissions and decisions were finally made. Here we present you with our final runner-up! Fiona Filipidis was born in Paris and later studied for a BA in Photography in France before moving to study for an MA at London College of Communication. We've interviewed Fiona here about the series To make a prairie. From poetry to politics, religion to architecture, the honey bee has managed to waggle-dance itself into every nook and cranny of the human world. Our relationship with the bee is one that spans thousands of years, and I have attempted to synthesise it in one single book. I divided this book into 6 chapters, each one edited in a specific way: a piece of writing is preceded by a full-page image and followed by a selection of images in relation to the text. The full-page images are of the stormy skies that descended over London on 16th October 2017, when hurricane Ophelia made her way to our shores. All I could hear and read at the time was “It’s the end of the world!” and I couldn’t help but find a parallel with what could potentially happen if bees were to become extinct. The texts are a mix of personal life experiences and detailed knowledge about the honey bee and its history in relation to us. The imagery is a mix of found artefacts and my own photographs. Mingling the past with the present is my way of showing our constant and ever-growing relationship with the honey bee. My hope is that there is something for everyone in this book; if a teenager were to pick it up and see a photo of Beyoncé, I would love for it to peak their curiosity and push them to do a little bit of digging. This project is more relevant now than ever. Every day, news articles emerge with ever-growing alarming headlines about bees and insects in general. We humans hold the fate of the wee honey bee in our millions of hands. By some unimaginable, intangible natural power, we have been given the gift of life, and it is our duty to make sure all living entities that share our cosmos continue on the path they were meant to take. Can you introduce yourself? What and where did you study? What's your motto? I am a 28 year-old multicultural photographer who grew up in the leafy suburbs of Paris, France. My dad is half-French, half-Greek and my mum is half-English, half-Scottish. I have Portuguese relatives and grew up surrounded by friends from all over the globe, which I feel all greatly contributed to my openness and curiosity for the world. I studied for a BA in Photography in Paris before moving to the UK to pursue an MA in Photojournalism and Documentary Photography at London College of Communication, from which I graduated this past January. I have never had to think about a motto before, but maybe “laughter is the best medicine”! I love a good chuckle. Give us an overview of your work. What themes do you like to explore? My most recent projects are all related to nature and the environment in one way or another. Prior to To make a prairie, I was working on an image/text concept book called El Dorado which deals with the notion of gold in its broadest of meanings, whether it be physical or purely metaphorical, and What do you want to be when you grow up? which portrays our desire to reconnect with nature through a humorous, albeit slightly strange, depiction of my fantasized mother/daughter relationship with Phoebe, my favourite houseplant. I always try to add an element of humour or levity to my projects and my writing, as I have come to realise that it helps people react to and interact with my work on a different level. I believe that you don’t always have to show the negative aspects of any given situation in order to bring awareness to it. I find the idea of talking about important issues contrasted with an underlying light-hearted tone to be a very interesting one that I would love to push further. I recently came across an article written by Tim Davis on photogeliophobia, or the fear of funny photography, in which he states that, “The history of photography’s overall overseriousness starts to feel like a first date that can’t laugh at the ketchup he’s spilled in his lap.” And the combination of spilt ketchup and the noise the bottle makes while doing so is more often than not quite amusing. What encouraged you to submit to the Loupe Magazine and Photograd call for work? Have you got any tips for photographers submitting work for similar opportunities? Getting your work out there is the tricky part upon graduating, as you want to use the momentum you’ve gathered throughout the year to propel you and keep pushing for your work to be seen. Photograd is the ideal platform to start, as you’re only a graduate once (or twice). I have been following the website for years now and have always been amazed by the quality of the photographic projects you choose to publish, and feel humbled to be in such great company. I am also excited whenever I come across new platforms such as Loupe Magazine, as I believe there can never be enough websites and magazines to showcase emerging talent. So the combination of both seemed perfect! My main piece of advice would be to keep applying to calls and competitions, even if the constant rejections can cause you to lose hope (which I have lost on many occasions, but keeps returning again and again). I find being organised to also be very useful; I have monthly lists organised by closing dates on my desktop so that I know when I need to apply for calls, residencies, competitions, grants, and what to send. How did this series come to the surface? Why did you decide to make work around our relationship with bees? It was all very coincidental, really, as most projects usually are! I was chatting with one of my tutors from LCC, Morag Livingstone, about what I could work on next when she, quite bluntly, asked me, “What pisses you off and what brings you joy?”. I realised there and then that a natural theme underlined all of my answers, and she saw my eyes light up when I told her about hives being kept on rooftops in the middle of Paris. I had also, like many other people, received dozens of email petitions to “Save the Bees” but had never given them much thought. And I had been struck by a photograph that was doing the rounds on Facebook at the time, showing what the fruit and veg aisle of a supermarket would look like if bees were to become extinct. So I started my research and within a couple of days that was it, I was hooked, all I could think of were bees, bees, bees. In my book, I quote British beekeeper R. O. B. Manley who defines bee fever as “a form of insanity from which you never really recover”, and to my great delight I think I’ve caught the bug, too. The outcome of To make a prairie is a photobook. Describe your book and particular layout of images. I divided To make a prairie into 6 chapters, each edited in a specific way: a piece of writing is preceded by a full-page image and followed by a selection of images in relation to the text. The full-page images are of the stormy skies that descended over London last October, when hurricane Ophelia made her way over here and people kept saying that it felt like the end of the world; I couldn’t help but find a parallel with what could potentially happen if bees were to become extinct. The texts are a mix of personal life experiences and detailed knowledge about the honey bee and its history in relation to us. And the pictures are a mix of found archival imagery and my own photographs. The image pairings are often comical and bounce off one another as I wanted to constantly excite the reader’s eye and not let it become accustomed to one type of image. My hope is that there is something for everyone in this book; if a teenager were to pick it up and see a photo of Beyoncé, I would love for it to pique their curiosity and push them to do a little bit of digging. As for the cover, the bee drawing was created by my cousin’s 5-year-old daughter, Caitlin. Was it important that you executed this work in the form of a photobook? Yes, I knew from the start that the final form of this project would be a book. I am an avid photobook reader, collector and admirer. I spend a good amount of time looking at sequencing, layouts, papers, binding techniques and feel genuine joy when I come across a book which excites both my eyes and my fingers! I had always wanted to make a book from start to finish, from the image making to the editing to the design of it, and saw this project as the perfect opportunity to do so. What are your future plans? I am currently trying to publish, or self-publish, To make a prairie, as well as working on a zine about a trip I took to California in February. In about a month’s time I will be doing a 3-week artist residency in northern Italy with Ardesia Projects and Jest, a photography gallery in Turin, which I am very excited about. And I will forever be working on researching bees in order to fully live up to my “bee-lady” image! For the duration of March we were seeking work from photography graduates alongside Loupe Magazine to reward with a collection of prizes and interviews. A lot of time was spent looking through the submissions and decisions were finally made. We're really pleased to present here the first runners-up interview. Lorenza Demata is a photographer and visual artist originally from Italy who studied for an MA in Photography at London College of Communication. We've interviewed Lorenza here about the series It all started when some of us left the country. It is estimated that expatriates constitute approximately 40% of London population. At the same time, almost 50% of the total consumption of food resources relies on the importation of fruit and vegetables from other countries. This project is an investigation of the notion of identity in the contemporary migratory context. The displacement of human resources is explored through a visual analogy with imported fruit and vegetables. By creating this parallel relation between people and food commodities, Lorenza aims to unveil the process of redefining individual identity that often takes place in the experience of expatriates. The photographic series and the book ask the viewer to critically reflect on the role of the human workforce in the political context of global migration. Can you introduce yourself? What and where did you study? My name is Lorenza (Lori) and I am a photographer and visual artist based in London. I come from Florence, Italy, where I first graduated in International Cooperation and Conflict Management. After my first BA, I studied Photography for three years at Fondazione Studio Marangoni in Florence, until September 2016. Then I moved to London to attend the MA in Photography at London College of Communication. I recently graduated and I am now working as a freelance photographer in London. Give us an overview of your work. What themes do you like to explore? Because of my multidisciplinary background, the content of my works is somehow always linked to social and political issues and it investigates themes related to the ideas of identity and culture. In my latest works, I have been particularly interested in the processes that influence and change the concept of cultural identity in the contemporary globalised context. I usually address these concepts through portrait and staged photography, by subverting and experimenting different approaches. As a result, I would say that my practice sits between documentary and conceptual photography. What encouraged you to submit to the Loupe Magazine and Photograd call for work? Have you got any tips for photographers submitting work for similar opportunities? I usually try to apply to as many open calls as I can. I think these kind of calls are a good opportunity to show work, as well as to get feedback and responses. It is useful to always challenge ourselves and to confront our work with others. Accepting feedback and criticism is not always easy. But taking into account constructive suggestions can make you understand how complete your work is and it can contribute to make positive improvements. How did this series come to the surface? Why did you decide to investigate identity in the contemporary migratory context through the use of photography? When I started my MA in London I wanted to investigate a theme that could be somehow close to my personal experience. I started wondering to what extent cultural identity changes when we move from our country of origin to another. I have also been interested in the process of commodification of the foreign human workforce in general and in particular in London. I think it is important to reflect on identity and cultural issues in this place and in this historical moment. Almost half of the population of London is constituted by people from other countries. While gathering data for my theoretical research process, I also found out that a large amount - approximately 50% - of the food commodities we consume in the UK is imported from somewhere else. By visually connecting expatriates to imported vegetables and fruit, I want people to reflect on how much a country relies on the global importation and migration, as well as on the role of foreign people in this context. The outcome of It all started when some of us left the country is a photobook. Describe your book and explain why you executed your work in this way. 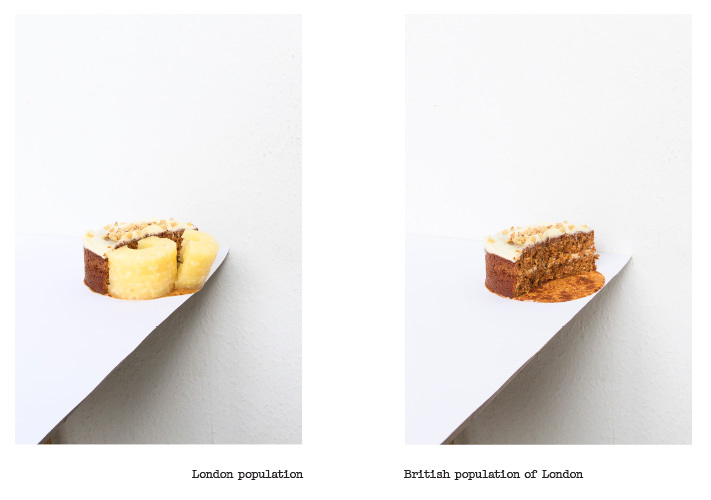 The diptychs are usually installed in exhibitions as a series of booklets, which aim to recall the scale of a passport. The other part of the project It all started when some of us left the country - I is in the form of a book. In this section, I am investigating the concept of cultural adaptation by confronting a specific fruit with a personal story. As a result, the book mixes different visual inputs, such as screenshots, graphics, manipulated archival material and photographs. Why have you cut out the faces in your portraits? The face is one of the main elements which defines the identity of a person. It is, I would say, indexical of the existence of the subject, and this is particularly evident in identity documents. I chose not to show the face to reflect on the concepts of displaced identity and of absence. The size of the white square also recalls the photos that are used for official documents. I think my aim is to underline how it is challenging to define ourselves culturally and individually. Tell us about the accompanying pieces of fruit in your images. How have you linked fruit and portraits together? For the still life photos I gathered data about the most imported fruit and vegetables. Every piece is paired with the portrait according to the colours. I did not want to link the food with the subject on the basis of the same nationality. This way I want to enhance the concept of displacement and of distance of commodities and people. Furthermore, I mean to underline how the movement of goods and human migrations are global, by going beyond national borders. What are your future plans? At the moment, I am going on with this project and with the specific fruits and stories. In the future, I would like to investigate the social and cultural relationship between expatriates and locals. I also want to analyse some form of local cultural ‘resistance’ in the economic context, either in London or somewhere else.